Hauntingly beautiful Halong Bay cruises is famous for its fascinating limestone Karst scenery with around 3,000 islands rising from the clear emerald water. And you know Halong, which means the dragon descending to the sea in Vietnamese become the highlight of any Vietnam trip. 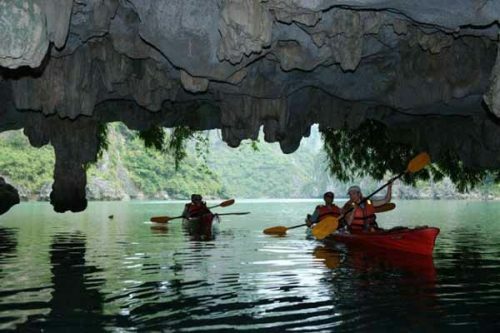 Taking a boat trip and exploring the grottoes, caves and tiny islands are very interesting things to do in Halong. 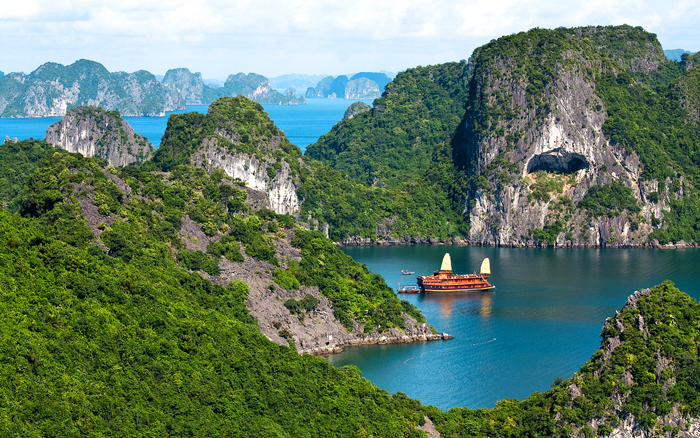 Today, Halong Bay has been known worldwide as one of the most outstanding world heritage. Absolutely, when travelling to Vietnam, this is the destination that you must travel to. 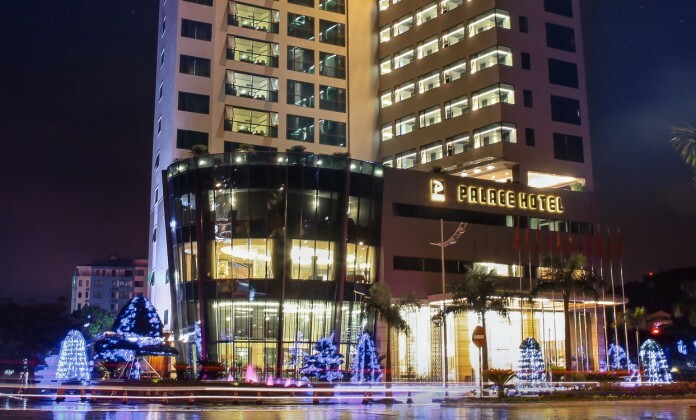 Since one of the hottest spot in Vietnam for traveling, therefore, many hotels were built to meet accommodation demand from a large number of travelers year around. 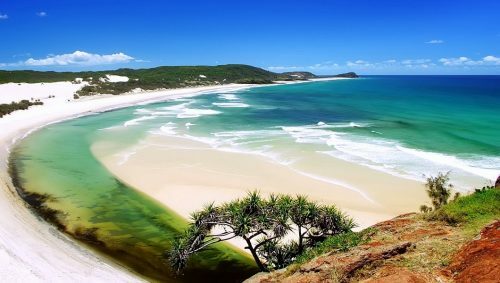 However, choosing a good place to enjoy your trip really become important. So, here are some best places, where to stay in Halong for interest, recommended by experienced travelers for new ones. Paradise Suites Hotel is the first and only boutique style hotel in Halong Bay. Paradise Suites Hotel already famed for the leading quality and service offered on the Paradise cruise ships, now it extends that premium level of hospitality to the shores of this natural world wonder. The Paradise Suites Hotel is really a display of elegance inspired by the enigmatic Halong Bay. Especially, each boutique room is a suite, and has been crafted to meet the expectations of the today world travelers. The restaurant offers an extensive menu of inspired fusion cuisine in elegant but cozy surroundings. The finest natural ingredients and modern amenities are a perfect combination to create the only style and truly comfort, which only the hotel just owns. Staying here, you can rest and relax by taking a rainy shower in en-suite bathroom, then leaning your back on fabulous dream beds before and after exploring Halong Bay. Also, you can Lean your back on a lounge, sit down by a desk to write a card, or watch your favorite channel to be comfortable as you like. Thanks to its ideal location, Paradise Suites Hotel offers you great chances to venture out the World Wonder and its beautiful surrounding area. 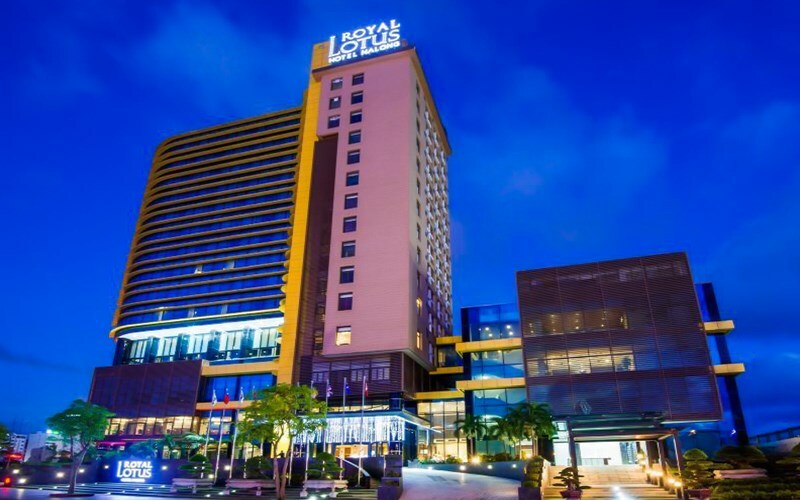 Royal Lotus Hotel Halong is just 5 minutes away from Halong pier and few minute walk from Central Business of Halong Bay. 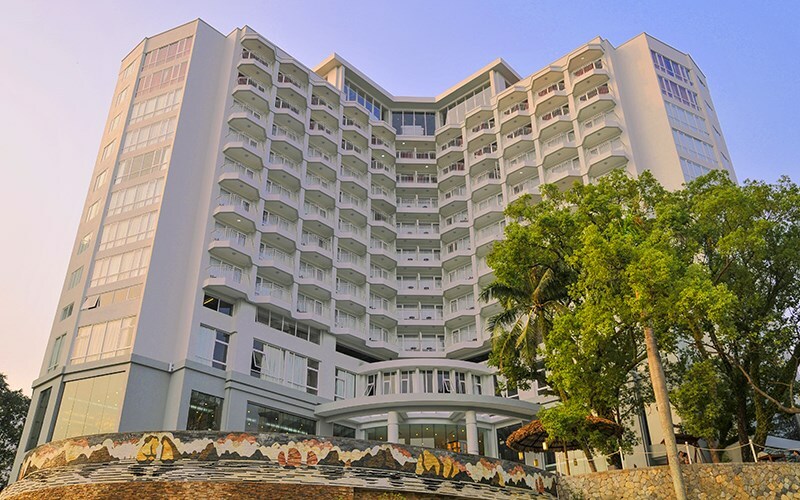 This business hotel in Halong is located at on the main Hung Thang road with the view of clear bay and the city in perfect harmony with the nature. Royal Lotus Hotel Halong offers a touch of Vietnamese hospitality with international standards and impeccable services. Boasting 147 elegant rooms with luxurious amenities and modern facilities, this hotel is among the first choice for your accommodation in Halong, both business and leisure travelers alike. This hotel in Halong provides full of facilities such: Bai BuaThai Spa, Fitness Center, In-door Swimming Pool, Function Rooms and Roof Top Bar. Dining in Halong is a delight with 3 restaurants to choose: Wine Dine Lotus Vietnamese, International Restaurant and Hana Hana Japanese Restaurant. All there located in Royal Lotus Hotel in Halong. Novotel Ha Long Bay hotel is the 4-star hotel with the stunning panoramic views over the famous Halong. The hotel has sleek contemporary design with a distinctly Asian touch in accordance with setting the scene for your business meetings, family holidays or romantic breaks. The hotel will make you feel relaxed with the best outdoor pool in town or dine on tasty international and Vietnamese fare. Ha Long Palace Hotel is located in the commercial and tourist centre of crowded Ha Long city, with beautiful views overlooking the stunning Ha Long Bay. 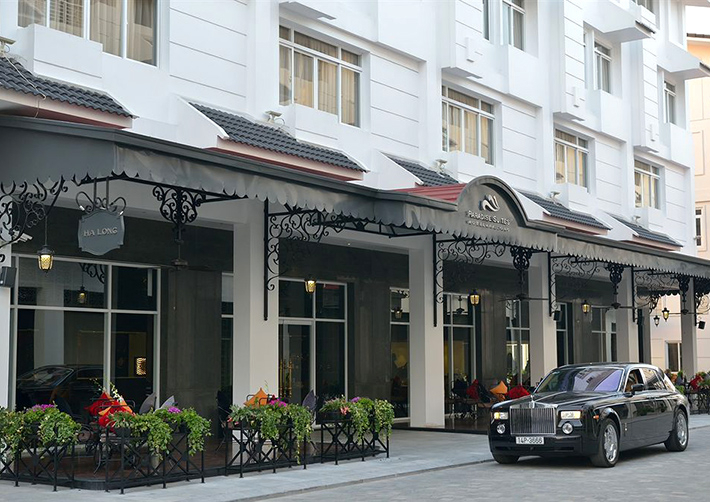 Unlike others, Ha Long Palace Hotel is one of the newest hotels in the Bai Chay tourist area. 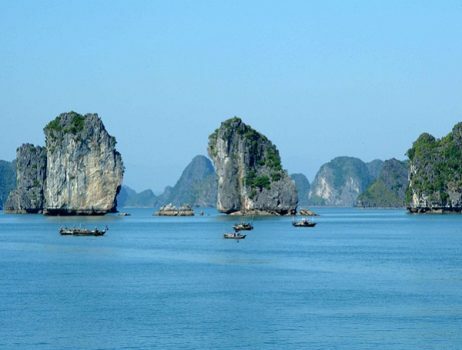 From the hotel, travelers can easily move to famous sites in the tourism complex of Ha Long Bay, such as: Bai Chay beach, Tuan Chau international entertainment resort, Cat Ba island biosphere resort, the City commercial centers or entertainment venues such as: water puppet parks, restaurants and night clubs. The Ha Long Palace Hotel has 17 floors and 119 rooms of all kind, from Deluxe to Premium, Suites and Palace Suites, which will assure to bring customers superior amenities along with excellent quality of service. One special thing of the hotel is a harmonious combination between modern architecture and oriental elements in the cozy hospitality of the Vietnamese people. If you are planning to travel to Halong, and confused where to say in Halong city. The four addresses mentioned above turn into very useful for you because choosing a good place to stay will make your trip more wonderful.